A few weeks ago, I presented a breakout session at Social Media Marketing World. I put together an all-new presentation about employee social media advocacy, which I have excerpted below. Thus, employee social media advocacy gives you Authenticity, Trustworthiness, and Reach. But, getting there isn’t a snap. There are many steps involved in creating and maintaining an effective program of this type. You need strategy, research, metrics, software (I recommend Addvocate.com, where I’m an investor). Note these are not the only ingredients. That would be a gross oversimplification. But these are seven that you need for certain. Only corporate cultures rooted in trust can do employee advocacy well. Social media advocacy doesn’t work at bayonet point. You need to allow your employees to choose the role that fits their skills and interests. Software that helps the company share content with employees (and vice-versa) is an important part of these programs. I’m a big fan of Addvocate.com. Easy-to-use, reasonably priced, mobile-friendly. I like it so much, I invested in the company. 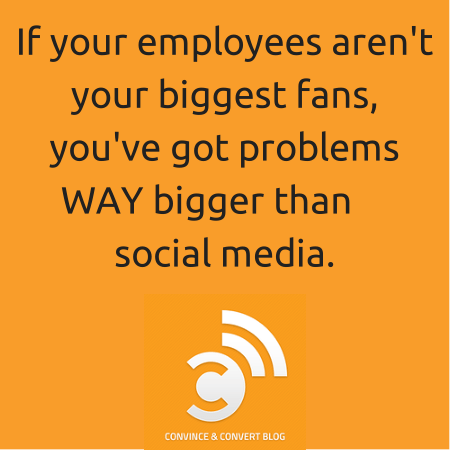 A big error in employee social advocacy programs is rolling it out all at once. You need to start with the motivated few, get them loving it, and then use their success to bring new employees on board in waves. This is critical. You must have a system where employees can get honest, private advice and counsel about social media on a day-to-day basis. Check out the increase in IBM’s results when their employees were watched up with social coaches (in the slides). If you need help thinking through or implementing this kind of program, let me know. The team at Convince & Convert and I would be delighted to assist. We’ve done a lot of this type of work.